The Christmas season is in full swing now, and even though I’ve been feeling a bit under weather, the Nichols household was rockin’ last weekend! I love intimate dinner parties, and we had a chance to host one this past week for which I really enjoyed the preparation process. Rich, sultry shades of gold mixed with hues of ivory and white with a little jolt of red here and there…one of my favorite holiday palettes! After 5:30 cocktails (a little earlier start than usual), the six of us sat down to a 4-course feast. Lively conversation took us into the late night hours. Back into the cozy confines of our dining room for this intimate dinner for six, I decided to do the flip of last week’s dinner party and go all gold & white. 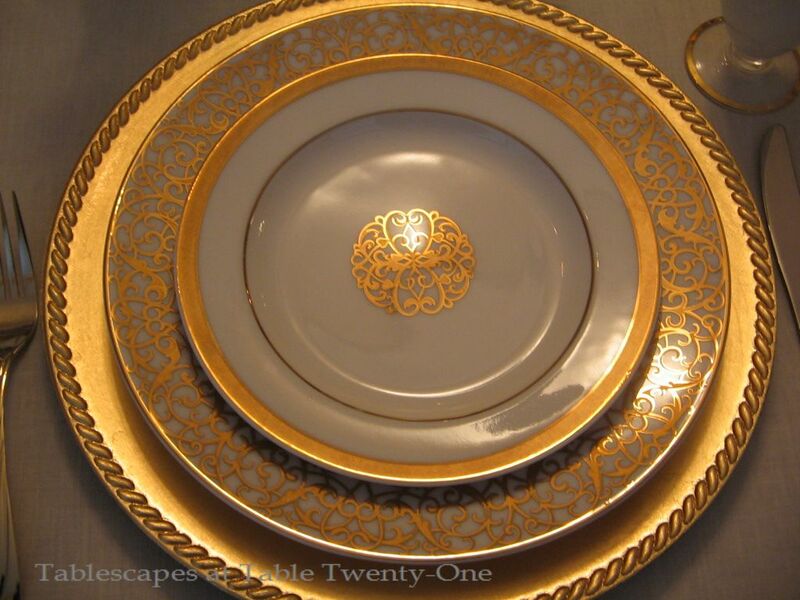 I bought this American Atelier “Florentine Gold Scroll” china years ago and have had only a couple of occasions to use it even though I love the design. (See this china used in a stunningly different tablescape HERE.) This table was set with the dinner plate and soup bowl only atop a gold braided-edge charger. (I took these photos late. The salad plates were chilling in the freezer!) 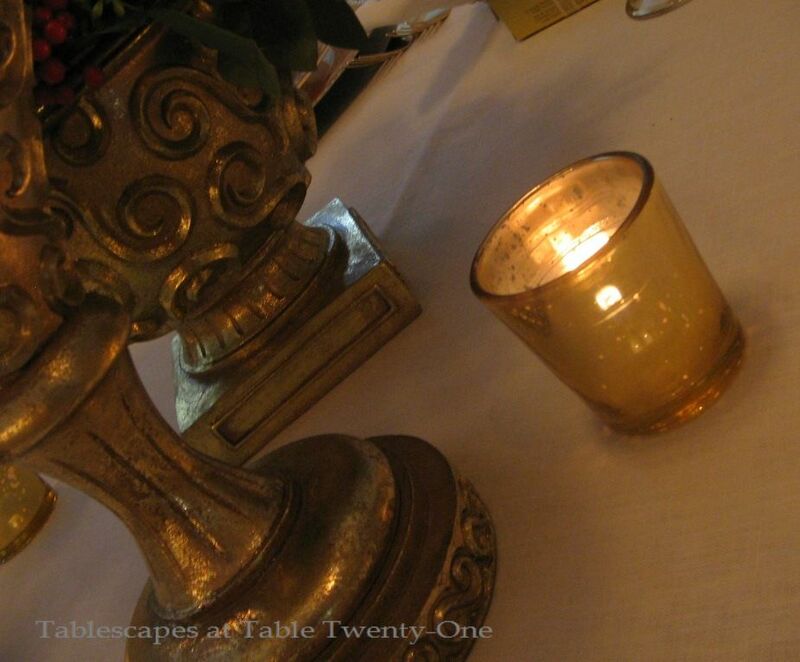 All the brilliant gold had a chance to really shine against the solid white table linen. My favorite favor – boxes of Godiva chocolates – fit right in! Keeping with the gold and scroll themes, I used goldplated flatware with a swirled design. The magnificent drinking glasses are part of a set my Mother purchased while on a trip to New York back in the 1970s. I always admired the set and am particularly drawn to the Roman soldiers on each. I have never set a table with these until now, but thought no others would do. 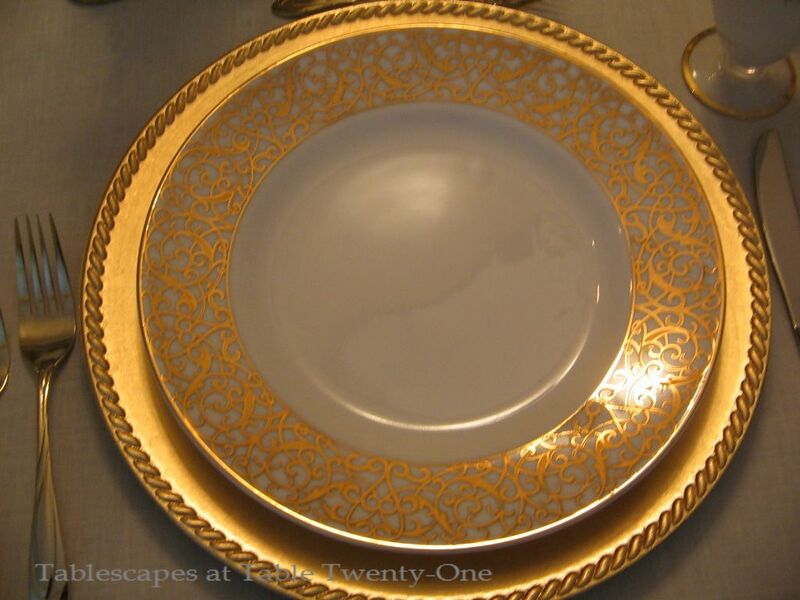 The intricate gold design just seemed to demand its place on the table! I am almost ashamed to admit how little I paid for these pretty napkin rings, especially since they are so closely hugging my gorgeous linen napkins. Truth be told: $1 each at Old Time Pottery. Shameful!!! 🙂 Again, their design elements just seemed the perfect match for this table. I bought scads of these cool gold mercury glass votive holders at Village Gardens in Blue Springs, MO. They emit such a fabulous glow! My centerpiece floral contains many of the same elements as last week’s post because I have TONS of this fresh seeded eucalyptus hanging out in my garage!!! The gold scrolled floral container is a perfect match for the china. A fat 3-wick candle perches atop another scrolled vase turned upside down. 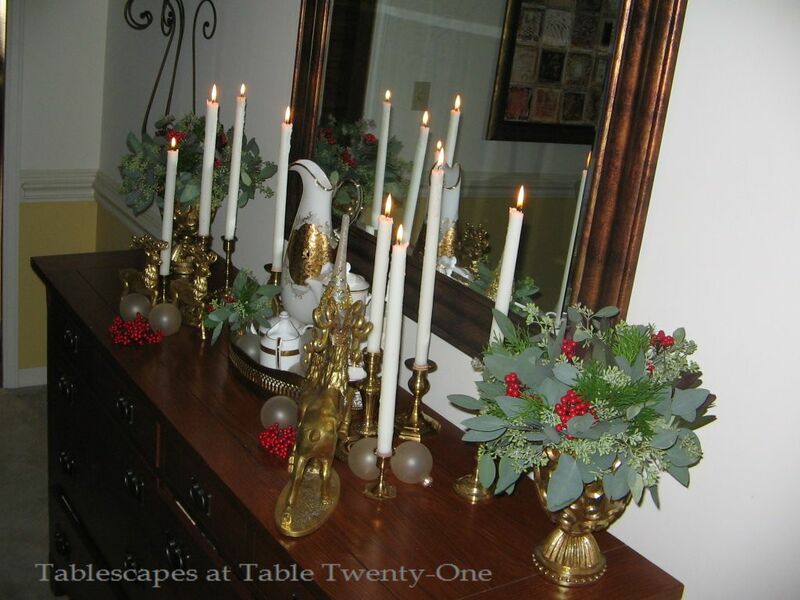 Other gold elements on the table include elegantly embellished tree toppers in coordinating designs and these fanciful reindeer candleholders I purchased years ago at a wholesale outlet. 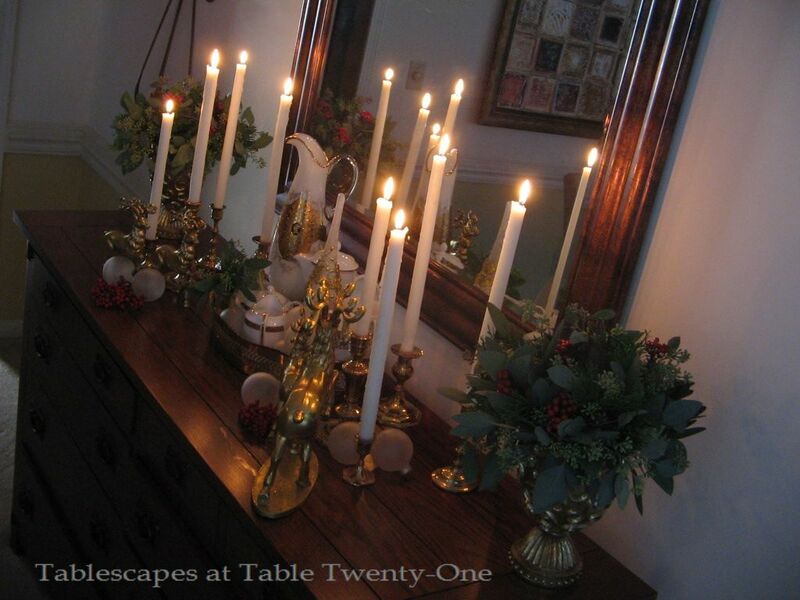 The sconces in the room got a holiday treatment of fresh greenery, berries and the same gold mercury glass votive holders. The buffet was decked out in florals similar to the one on the table, reindeer, frosty white ornaments, and lots of candles in brass candlesticks. The matching water pitcher! While it doesn’t hold a lot of liquid, it sure is pretty! I am thrilled to join Susan and all the other tablescapers at Between Naps on the Porch for Tablescape Thursday! 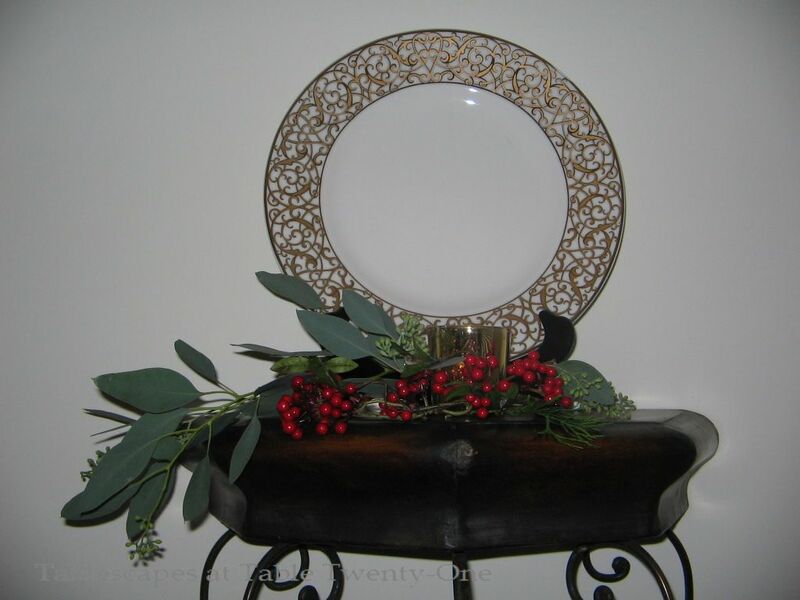 You’re invited to hop on over to check out other fabulous holiday designs!!! OOh I love those glasses from NY!!! They are really a beautiful piece of art and you are so right they are perfect with the entire table. I love the many votives and the centerpiece too. So extremely elegant! I love all the beautiful GOLD on the table. I would love to do one exactly like it. Have you SERIOUSLY not ever used those fabulous glasses and pitcher??????? I would drag people in off of the street to give a dinner party with those. Love it again! Hey, Linda! You are so funny!!! Nope…never used ’em! My Mom gave them to me and I just kind of used them as a decorative element in our library for a couple of years, then tucked them away safely. When I started working on this table, though, I KNEW they had to come out and play! Those tall candles are so elegant with your gold and white tablescape. I love the golden reindeer. This blog is like finding the Mother Ship! What gorgeous tablescapes. I have been captivated by them. And I love the elegent way you write about and descibe your tables. I’m hopelessly drawn to all things tabeware! And I feel like I have found a kindred spirit. Your rich and formal gold and white table is a feast for my eyes! I am taken with the goblets. How beautifully unusual. Perfection… all of it! Yvonne…thank you! I am absolutely flattered! When I first saw your name, I thought it was a comment from my Mom who is also named Yvonne. She always leaves nice comments, but this was more so than usual. I thought, “Uh-oh…what does she want? What did I do? Am I in trouble?” Then I saw Stone Gable and realized it was from you! (Whew!) I visit your site every week and look longingly at the exquisite tables you post. So it’s very nice to meet you, too! Thank you for being so sweet! My new fav! Gorgeous!! You’re amazing. Hey, Mona! Thank you!!! It’s a favorite of mine, too! Alycia, the pickle is just for flavor, but i think it’s an acquired taste.. try it in one and one without.. I hope you will try making them. great fun. I admire that you tried to learn German. It really isn’t that hard, just the dative case and the sounds.. I’m so glad I was able to bring up some memories.. I’ve never tried to make a pyramid. But I bet that would be fun.. Merry Christmas.. Your tablescapes are always soooo beautiful! I love the gold and white, so elegant and perfect for Christmas. You always have such lovely pieces–like those epergnes :)–and those lovely goblets this week! China is beautiful as well, and you put it all together with such style!! Thank you, Betsy! I’m a “collector” for sure! After I retired and closed my shop, I had a few little pretties that I wanted to keep. I’m grateful to have enough storage space at home for everything, but that is slowly running out. I’m either going to have to purge a few items (heaven forbid!!!) or build onto the house…again. I’m sure my husband will want to weigh in on that issue! 🙂 Have a great weekend, and thank you for stopping by! Such an elegant table setting. Those glasses and water pitcher are exquisite. This table is set for Royalty! Your guests felt like that, I am sure. I certainly would have! Thank you! You are just too sweet! No royalty that night, but we sure had a good time! That’s the cool thing about small dinner parties…you can just linger on, and on, and on…!!! Have a great weekend, and thanks for stopping in! Oh! this is a great idea and it really looks FAB. You always done a great job. Thank you for sharing for us specially me. Thank you so much, Chie! Great to hear from you!!! Hi, Mary! Thanks! Did you ever see that movie? I think I’ll rent it this weekend just to have fun. Thanks for stopping by, and have a glorious weekend!!! I just love your Roman Holiday setting! It is so pretty. I love the gold and white mixed together. Your china is perfect with those glasses too! I also loved all your centerpieces and gorgeous greenery!